Write Bloody Publishing, 9781938912849, 95pp. A beautiful exploration of grief by one of the top selling poets in America. 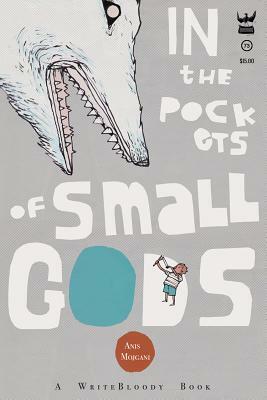 2-time National Poetry Slam Individual Champion, and winner of the Worldcup Poetry Slam, Anis Mojgani's In the Pockets of Small Gods explores what we do with grief, long after the initial sadness has faded from our daily lives: how we learn to carry it without holding it, how our joy and our pain touch, and at times need one another. His latest collection of poetry touches on many kinds of sorrow, from the suicide of a best friend to a broken marriage to the current political climate. Mojgani swings between the surreal imagery and direct vulnerability he is known for, all while giving the poems a direct frankness, softening whatever the weight may be. A book of leaves and petals as opposed to a book of stones, "In the Pockets of Small Gods" encapsulates the human experience in a way that is both deeply personal and astoundingly universal.